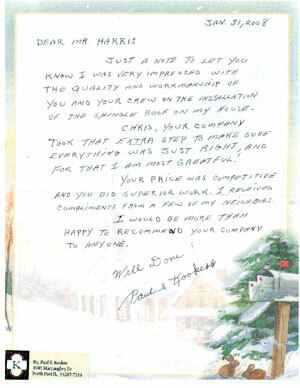 Here is a sample of the many testimonials we have on file from satisfied customers. Customers that are satisfied with our work are the biggest testiment to the pride in every roof project completed by Family Pride Roofing. Being a woman living alone, the prospect of needing a new roof was daunting. Just gaining the estimates was mind boggling. How can I interview a roofer to hire when I don't know what they're talking about or why I need this or that, or if that product is even any good. I decided to google the shingles that would be used by the most expensive estimate that I had gotten. Those particular shingles were rated very poorly and that shingles company was even in the middle of a law suit. Now I was even more scared and perplexed. One roofer said that I only needed repairs. 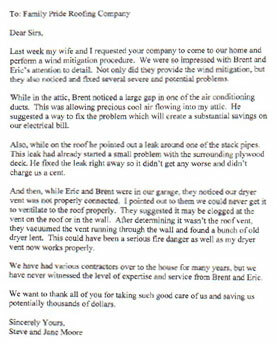 I knew that wasn't right due to the age of my roof plus it had been patched and repaired before. I was spared rejecting him, thankfully, because he never called me back. 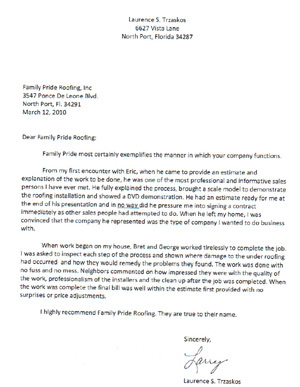 Finally, my friend Larry recommended you, Family Pride Roofing. I respect Larry and was glad for the referral but I still felt that I would get a snow job since I'm not a man. Erik came to my house with two hefty brochures, each with detailed information about the two different shingles that they use. Included in these brochure packages were certificates of achievement and completion by Family Pride Roofing, a copy of their roofing contractor license, certificates of insurance, references and a letter of praise. WOW that was impressive and appreciated. I knew I was going to hire this company to do the work. But I still went to google to check out the Atlas shingles and another WOW. It was all really good. The rainy season came and went, hurricane Irma came and went and finally it was time for Family Pride Roofing to re-roof my house. Again I was consumed with fear. A crew of men were going to scrape off my roof! The noise, the mess, the sheer idea of it made me want to change my mind. That's when I met Brent. He brought over large shingle samples for me to choose the perfect color. 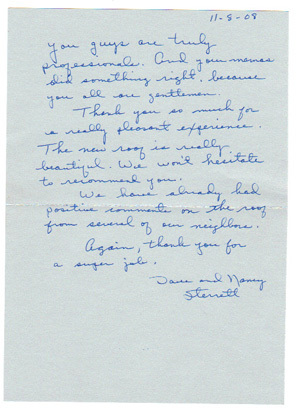 Brent kept helping me with my decision until he was satisfied that I really was sure and happy with my choice. He also told me exactly everything to expect. After all, isn't it the unexpected that we really fear? Brent told me the first day would be the scraping off of the existing roof and the next day it would be the tapping in of the new roof. He warned of debris but assured me that it would all get picked up. That's the only part I doubted. I am a litter fanatic. I pick up litter everywhere I go. I even stop my car to pick up litter that looks dangerous to wildlife. The noise was not that bad. I have a flock of small pet birds in the house and they didn't even seem to notice. As for the debris, it was picked up almost as fast as it was dropped. One of the workers made routine rounds walking the perimeter of my house. At one point I went out to check my mail and I saw a long piece of plastic wrapped loosely in a bush by my front door. I easily reached it and pulled it out and left it by my door so I could throw it away. When I returned a minute later the plastic had already been retrieved; I had to laugh. When the job was finished Brent and Sean came by to run a large magnet over the yard to pick up any undetected debris that might have been in the grass. I noticed a couple of places that needed repair: one on my soffit and one on my fascia. This had nothing to do with the roofers and everything to do with Irma. I asked Brent if he would fix that for me and I offered to pay him. Without hesitation Brent fixed the two areas and filled holes that I hadn't even noticed. He shrugged off the extra payment but I paid him anyway. 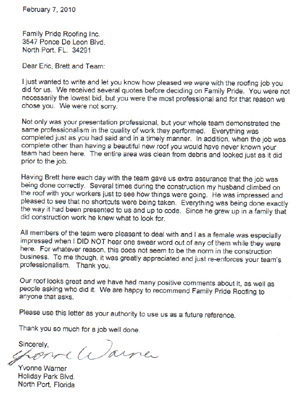 Every step of the way Family Pride Roofing went above and beyond. 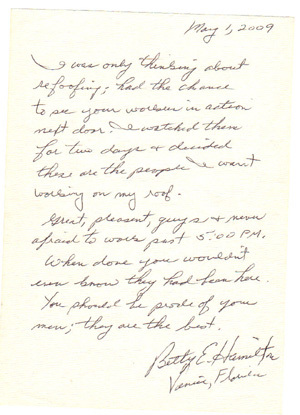 They did that little extra for them which felt like moving mountains for me. As Brent left he said he'd shake my hand but he was dirty from doing that job for me. Hand shake? I would gladly have given my new friend a hug. I hope I live long enough to need a new roof, as long as it is with Family Pride Roofing! During the heavy rains of Hurricane Irma, I found a puddle in the office area of my home. This being the second leak I found that year, I knew it was time for a new roof. I called 4 roofing companies to give me an estimate. By far the best quote in terms of cost, warranty, and time to finish, came from Family Pride roofing. It made the decision easy for me! 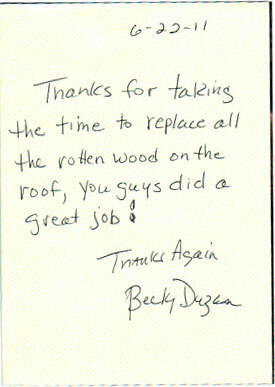 They began my roof the same day they said they would and Brent kept me informed on their progress. Their crew worked hard and made sure to clear my yard of any debris at the end of the day. To my surprise, the job was complete in less than 3 days! My new roof looks beautiful, and my house looks new again! Not to mention free of leaks. I can’t thank Family Pride roofing enough! Especially Brent and Reena who treated me more like a friend than a customer. I highly recommend them to anyone looking to replace or repair their roof, they are more friendly and professional than anyone you’ll find! Copyright 2018 Family Pride Roofing Inc. "All Rights Reserved"